"It was visited by all the gentlemen and gentlewomen for the size and beauty of its flower. But now it is so vulgar that no one cares about it". 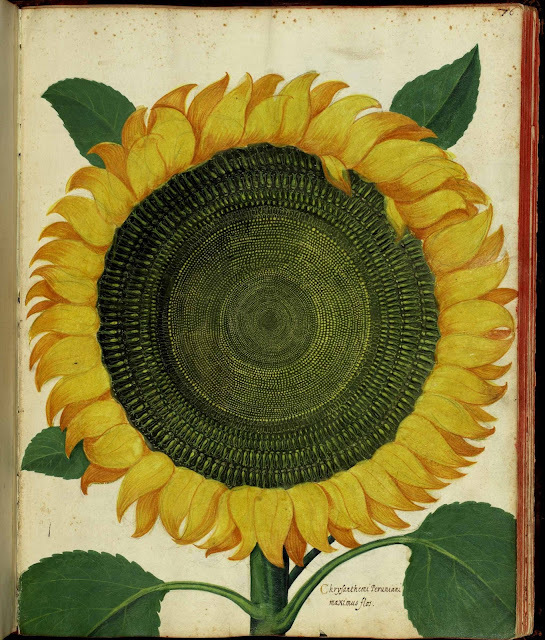 Ulisse Aldrovandi on the first "Peruvian Chrysanthemum" seen in Italy (actually a sunflower), planted in Bologna in 1594. Seen above in his 18 volume Tavole di piante, available online in its entirety at the University of Bologna. Hahahaha... Glad to know there is nothing new about the faddishness of gardening choices. Thanks for the fun link! Thanks a lot for the interesting link! I chased the link and it blew my mind! What staggering stuff and SO MUCH!